This is a dish from my childhood. For all the memories it evokes, though, I don't recall particularly liking it at the time. I do now, though, and my family prefers it to mashed potatoes. Boil potatoes until tender. Drain. 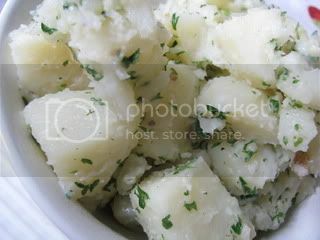 Add remaining ingredients to potatoes and stir gently until potatoes are coated. This is so simple that I don't even feel right linking it up to the recipe swaps! Hope you like it. Since hubby began dieting I've eaten almost no carbs. The potatoes do look delightful, I think I need to go on a carb eating binge to catch up! I have been making potatoes quite often lady. I will have to try making them your way!